I received a leather hide in the mail last week I immediately wanted to get creating with it (that is of course after I wrapped it around me like a blanket and smelled it like a thousand times). However, I’ve never had a whole leather hide to myself, I kinda got the jitters a bit when I had to actually cut into it. So bad I still haven’t. But I had to, someone at the Leather Hide Store was expecting me to. I decided I would just shave a bit off the edge, baby steps, right? Plus, my camera works so hard, I decided she deserved a new leather camera strap. 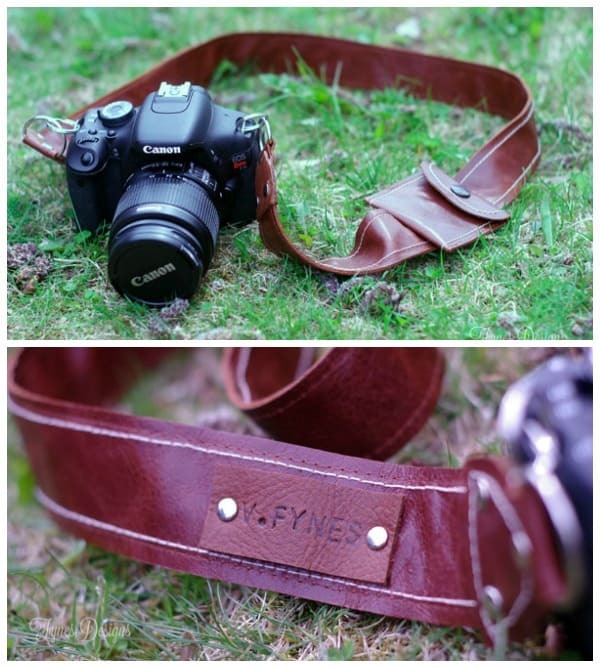 This leather camera strap is super easy to make, and doesn’t require any fancy sewing. 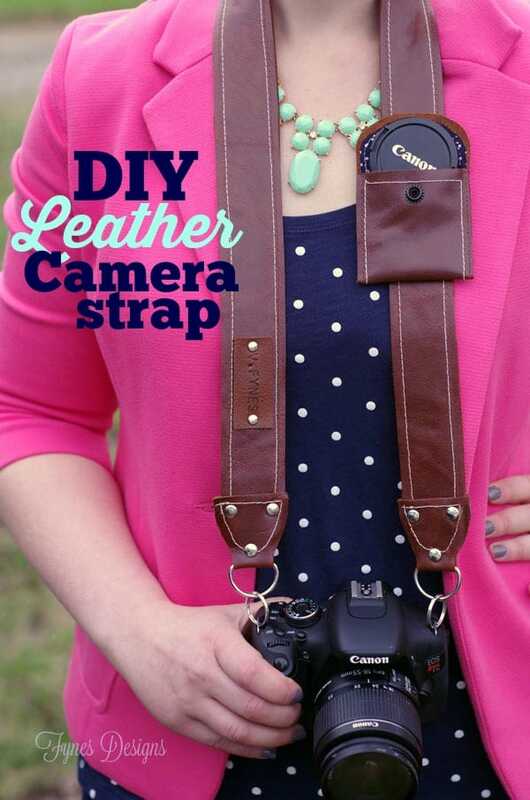 Follow along to learn how to make this easy Leather Camera Strap with a lens pocket. Leather- two strips 2″ x 38″ (the length may need to be adjusted depending on the height of the user). Plus 5 pieces cut from the included pattern (download here) for the strap ends, and lens pocket. 1 piece of fabric 3″ x 7.5″ to line the lens pocket. 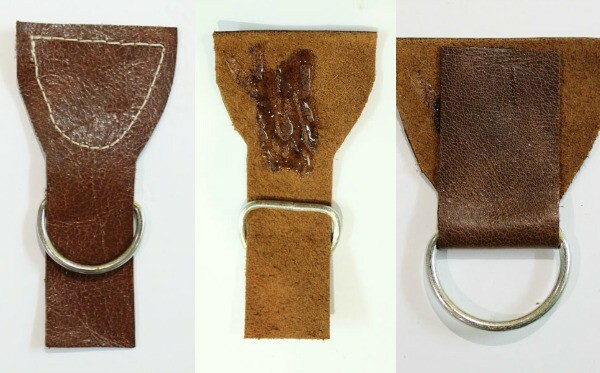 2- 1″ D rings, 2- split key rings (although if you can find lanyard rings I think they would be better). 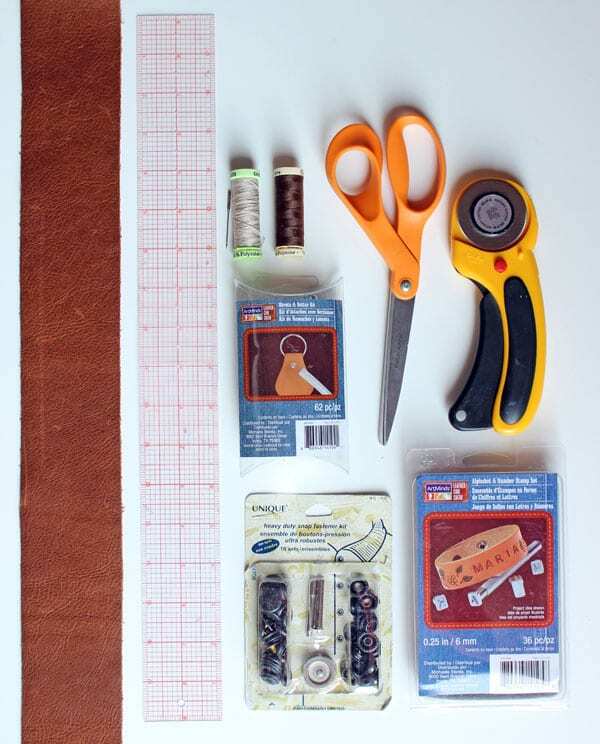 Scissors, rotary cutter, ruler, top stitching thread, coordinating thread to the leather, rivet kit (I got mine at Michaels), snap kit, fabric glue, leather stamp kit (optional, available at Michaels also). To start, if you’ve never sewed with leather there are a few things that are good to know if using a basic machine. Sew slow, with a long stitch length. Use a needle specifically for leather/vinyl. A leather needle is like a knife on each edge that will slice as it goes through, unlike a regular needle that will puncture the leather, potentially damaging your machine. If you plan to top stitch do it on one layer of leather, the more layers the harder your machine has to work to pull the thick thread through. To learn more visit Delia Creates where she has put together a short list of tips. After you’ve cut your two long strips, and your pattern pieces, the next step is to top stitch if you choose. Totally not necessary, but it gives that finished look. If you do, at this point you will stitch around one of the long strips, and around the two key shaped pattern pieces. Assemble the lens pocket. Sew the fabric with the wrong sides together around the parameter. Using your lens cap as a guide determine where the pocket will need to fold. 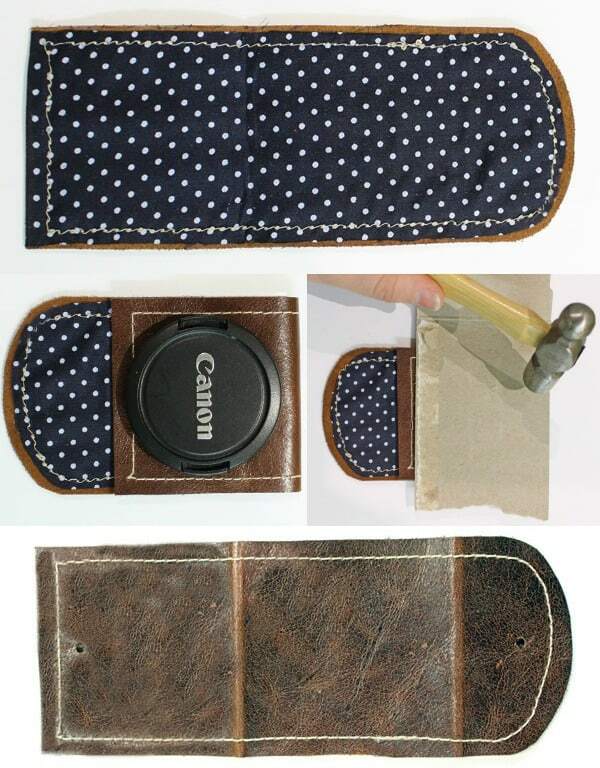 Place a scrap of cardboard over the leather and bang on the crease with a hammer until it will stay folded. Punch holes and apply a snap using the snap kit. Now you will sew the two long strips of leather together using the coordinating thread color, around the entire parameter. Next you will need to assemble the ends of the camera strap. You will need the 2 pattern pieces shaped like a key, the two D rings and the fabric glue (E6000 would work too). Slip the D rings onto the long strip, squirt a bit of glue on the leather and flip the tail up. Hold with a binder clip until dry. Attach the pocket to the strap- Try the long strip around your neck and determine where the pocket would be best, mark. Lightly glue pocket in place, using a chalk pencil mark where you will sew to attach the pocket in a square with a ‘X’. This will be between the two crease marks you made with the hammer. Fold pocket bottom up and sew the two edges closed. Add the strap ends to the long strips of leather by sandwiching between the two pattern pieces, using the rivet kit ad 3 rivets to secure. Instructions will be included in the package. On a additional piece of leather, if desired use the leather stamp kit to personalize the strap by adding your name. Attach with rivets. Attach the strap to the camera using the split rings. So what do you think, prepared to never loose your lens cap again? This leather camera strap is a great beginner project for leather work. Should you have any questions please don’t hesitate to ask! I LOVE this! 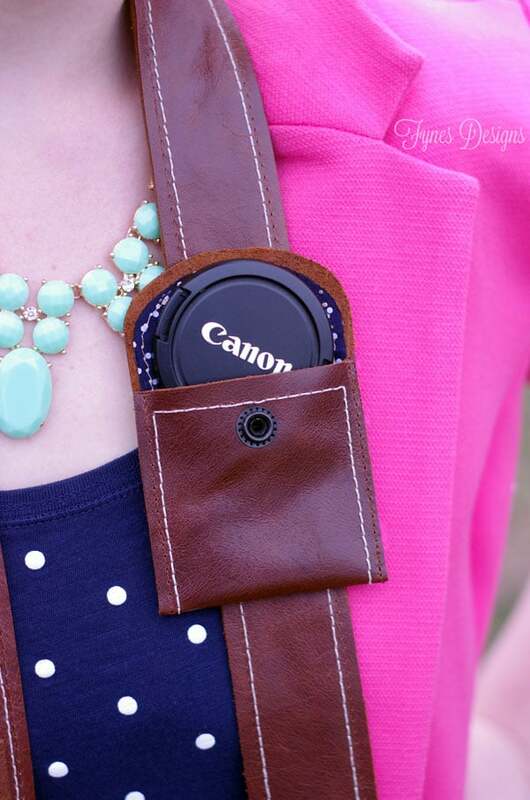 What a great idea to have a lens cap pouch. How many times have I looked for somewhere safe to put my lens cap when I’m taking photos? This is perfect. This strap is awesome! The lens cap pocket is nearly genius. So cute! I especially love the lens cap pocket! Great work. I’m loving this, Virginia! Man, you’re so talented! I would probably use the leather hide to create a silhouette for a pillow… I wonder if my cutting machine could tackle a leather hide? Hmmmm good question, I love your camera strap idea, especially a place to keep the lens cap! I would maybe try some napkin ring holders. But I like Tara’s idea of creating a silhouette for a pillow. What a great camera strap; I love it! Thanks for sharing the tutorial; I’m totally pinning it. I would LOVE to work with real leather. I never have and I’ve always wanted to! Your leather camera strap turned out great and I would have been nervous too cutting into it! I would use the leather to make purses and tote bags, and the camera strap for my husband. I have worked with leather for several years and it is wonderful to work with. That is so beautiful! Love it. What a great camera strap!! I can’t believe you made it!! Its stunning!! I love the holder of the cap. I always loose mine because they normally don’t come with one! What a great idea! I would never have thought to make my own camera strap. Your’s turned out so beautifully! I think I’m going to cry – I have been LOOKING ALL OVER THE PLACE for something like this. How many times have I lost my camera lens cover and in a panic I would spend the last half an hour of my session retracing my steps. This is brilliant!! SO glad you like it, I lost mine about a 1000 times before I figured out a solution! Wow! That camera strap looks awesome! You are so creative! I would never be able to do something so neat, especially use a white thread on a darker fabric. hehe! Your camera strap looks great! I would use leather to create bridles/reins for my hobby horses. You’re more than welcome to stop by my party and link up anytime! I’d make a leather bag for my camera! I already have a big one but I’d like something small to carry the camera and an extra lens in. I LOVE your camera strap! I usually do my straps as wide as the pocket but that can get kind of bulky…I like your idea a lot better! I really want to make a small leather purse with the leather, I just want it to be a ‘perfect’ idea before I cut into it. Thanks for stopping by! This is such a great project! 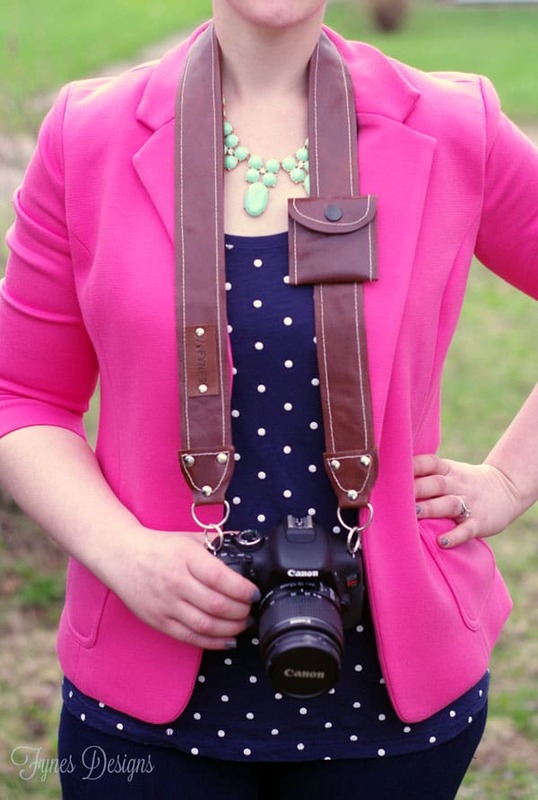 I love, love that you added that cute pocket for the lens cap! 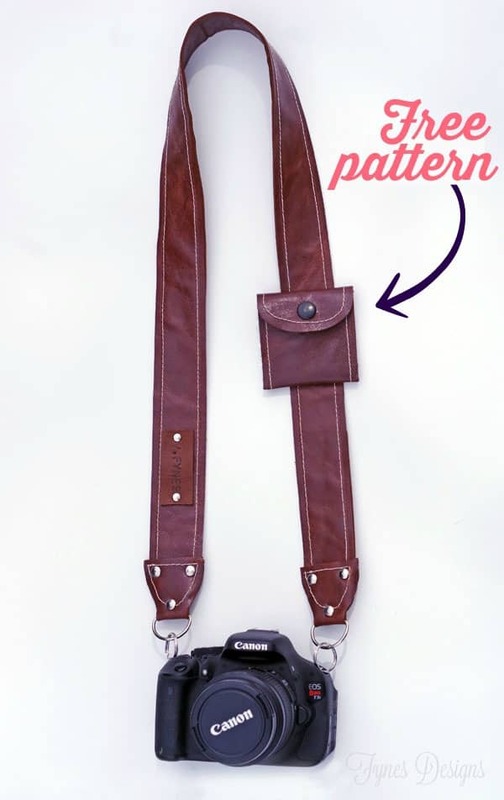 (I may or may not have lost mine a few times…) If I won this fab giveaway, I would make a camera strap exactly like yours. Seriously, I love it. Would you please come by and share it with us at The Makers link party if you have a second? This is absolutely amazing and beautiful. I never even thought about making a camera strap (where have I been?)! Found you via Inspire Me Wednesdays…and this really did inspire me! The lens pocket is genius- I am always wondering where I stuck the lens cover when I’m done shooting. I LOVE this and can’t wait to use your pattern to try it out! Love this camera strap, especially the little lens cap pocket. And the leather is amazing. Thank you so much for sharing on Inspire Me Wednesday. Featuring you in next week’s issue. Wow this is fantastic! I would love it if you joined and contribute your awesome posts at my link party at City of Creative Dreams on Fridays 😀 Hope to see you there at City of Creative Dreams Link Party. Love it, Virginia – it’s a great looking strap! Now, I think I really want one! This is an awesome way to use leather hide – I love it! I have been wanting to make a new camera strap for a long time! This one is great. I never thought to use leather to make one, but I am sure it will hold up really well and be super durable. Thank you for linking up to The Creative Exchange! I love this so much! I lost my lens cap a few months ago when it fell out of my purse at a local public garden. This would make it so much easier to keep track of that kind of thing. Thank you for sharing your craft at Fabulously Frugal Thursday! This is kinda sorta totally rocking my socks off! I’ve been looking for an inspirational camera strap tutorial…and I think I hit the jackpot here! Thanks Lauren! I hope you can use the pattern! You’ve been featured at Link’n Blogs! Stop by to see your feature and link up more fab posts! I am SO excited to try making this camera strap! I always misplace my lens cap. This is fantastic! I love the detail you give. Thank you very much.